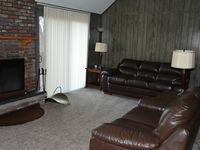 Property 3: Poconos Home w/ Fire Pit, Hot Tub, Deck & Grill! Property 7: Large Lakefront, PRIVATE POOL, Free boats, dock SPECIAL DISCOUNT! Property 10: Secluded Pocono retreat. Property 11: Private House, Heated Inground Pool & Game Room, 5 mins. to Shawnee, Mount! Property 14: Beautiful Country Home with Waterfall and Hot Tub! Property 19: LD - Lakeview newly renovated 6 bedroom home with multiple community amenities! Beatiful Large Lakefront home. Boats, Dock, SPECIAL PRICING!!! Property 20: Beatiful Large Lakefront home. Boats, Dock, SPECIAL PRICING!!! Property 21: Have your game night in the woods. Cozy Poconos cabin designed for a round. Property 25: Escape to a BEAUTIFUL Secl, Streamfront w/ HOT TUB-Relax here this winter! Property 26: Magnificent Poconos Home!! Property 29: Family friendly, amenities full, the most local and onsite activities! Property 33: LG, Beautiful, Secluded LAKEFRONT-AMENITIES-HOT TUB. Fall is beautiful/Poconos! Property 38: Large creekside family home with access to resort amenities! Property 39: Charming Bushkill Home w/Large Deck & Pool Access! Property 42: Modern Rustic Lodge! Walking distance to Ski Slopes and Ski Lodge!! Property 43: Streamfront, Modern 4000 sf, Sauna, Wi-Fi, A/C. Creek-front, Modern House with Volleyball court on backyard. Wi-Fi. A/C. Property 47: Creek-front, Modern House with Volleyball court on backyard. Wi-Fi. A/C. Property 50: MacShack is a charming house in a amenity filled community of Saw Creek Estates. Beautiful home. Very comfortable, quiet and relaxing. Rab P. Is on point works with you and price is reasonable.. Would recommend anytime!! Thanks Rab P.